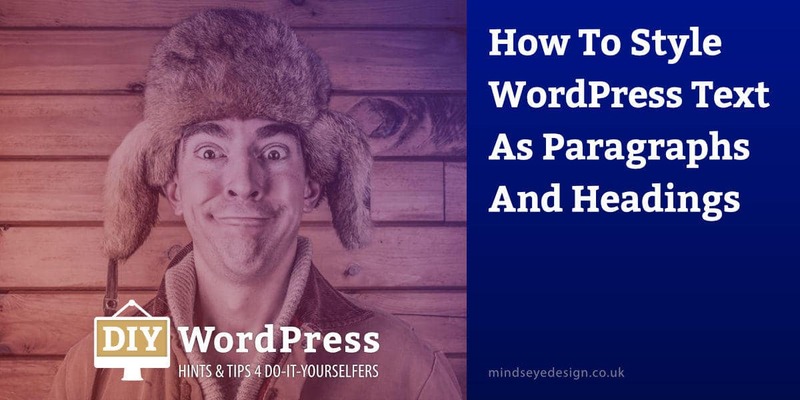 Style WordPress content as paragraphs and headings to divide your WordPress content into sections and give it HTML tags which enable search engines to rank your content for showing in web searches. Organising and styling your text correctly will positively affect your SEO rankings too. How do I create a Heading in WordPress? Place your cursor anywhere in the line of text you wish to make into a Heading. Click to open the ‘Paragraph’ drop-down menu on the far left of the toolbar. Choose the heading you require e.g. ‘Heading 2’. You will see the text change style in the Visual Editor. Click on ‘Preview changes’ in the top right of the Publish module to view the changes on your site before they go live, then click on ‘Update’ to publish your changes. Tip: Using ‘## heading text’ will transform the text into a Heading automatically eg: Type two hashtags, then a space, then your heading text to create a Heading 2. Typing three hashtags beforehand creates a Heading 3. Highlight the text that you want to make into a Paragraph. Check the ‘Paragraph’ format drop-down menu on the far left of the Toolbar. Ensure it is set to ‘Paragraph’. Here you can preview your changes on your site before you publish them. When you are satisfied with your changes, click on ‘Update’ to publish them to your website. Extra: The difference between ‘Visual’ and ‘Text’ Editor mode? The Visual mode is the default editing mode, which gives you the range of Toolbar formatting icons to enable you to create and edit your content with ease. The Text editing mode has fewer options and allows you to create your content in HTML mode.